6B Explores what a successful serve looks like in Badminton! 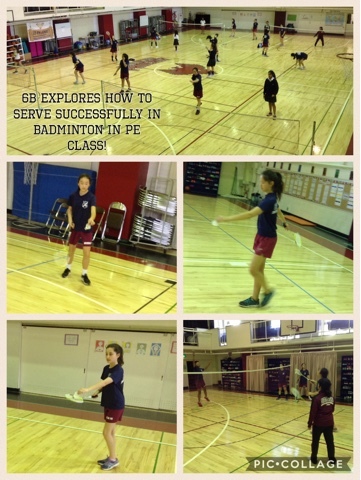 6B Explores Badminton in PE! Central idea: Learning the fundamental skills and techniques of badminton such as movement, striking the shuttle/birdie, game sense and strategies. The 6B class has spent the last few weeks learning the basic skills to badminton and introduced to the game! The first skill they learned was how to properly serve. 5). Don't throw the birdie and make contact with the racquet! They have also been introduced to the different types of strokes: forehand, backhand, overhead clear and smash. The girls have really enjoyed the round robin single tournament and playing against their classmates! To wrap up their unit they are competing in a doubles tournament! All hands on deck! Exhibition is next week! The buzz in the Grade Six Building is ELECTRIC as the student's prepare for their Exhibition next Friday. Students made a checklist of assignments and tasks that need to be completed before next Friday. It's going to be a busy week! The robotics group discuss and make some changes to their oral presentation. The Bullying Group practice their dramatic monologue. The Health and Wellbeing group discuss the main points they would like their audience to come away with. The Medical World group are on the steps to success! What should we really teach about addiction? A rich discussion under the stairs. "We want our audience to feel accountable for pollution". A discussion on how this can be achieved. As Exhibition approaches, many groups are collecting data to help them with their inquiries. Please take a moment to fill out the surveys below and help our Grade Six investigators to gain a deeper understanding of their Exhibition Issues. What do you know about robots? How is overproduction of clothes affecting the environment?